The Parlux Alyon Hair Dryer in 'Coral' is an ergonomic, lightweight hairdryer developed with air ionizer technology. Providing a quick blow dry for healthier hair, the 2250 watt hairdryer is powered by a revolutionary K-Advance Plus motor for advanced drying results. Delivering 84 cubic metres per hour airflow, the hairdryer allows you to dry your hair faster to maintain healthy locks, and has ionic ceramic technology for smooth, static-free results. Lightweight, quiet and durable, the hairdryer has an in-built silencer and a variable geometric heating element with optimised heating areas to ensure more stable temperature distribution. Also features a unique hair-free system which can be removed and cleaned to keep the device functioning at optimal efficiency. Complete with soft touch switches for user comfort, and a built-in cable flex. 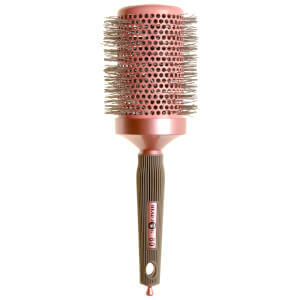 Receive a FREE Head Jog Pink Ceramic Ionic Radial Brush 80 (80mm) when you buy selected Head Jog products. Complimentary gift will be awarded at the basket. Offer valid for a limited time only, while stocks last.